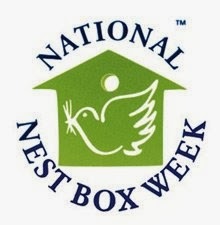 As you probably know this week (14th – 21st February) is the BTO’s (British Trust for Ornithology) National Nest Box Week. They are asking everyone to put up a nest box in their local area to help increase the number of suitable nesting for birds. Even though you can put a nest box up at any time of the year this week is to encourage people to put one up whether it be at a local park whilst out with a wildlife group or in your back garden. Even if you already have lots of nest boxes up in your garden you could still go out and clean them out ready for the Spring. The reason why you should take part and why they are holding this event is because natural nest sites for birds such as holes in trees or old buildings are disappearing fast. Taking part will give you the chance to contribute to bird conservation whilst giving you the pleasure of observing any breeding birds that you attract to your nest box. Previous PostStaffordshire’s Badgers.Next PostLocal early signs of Spring. I have just put one up, before I read this. How's that for a coincidence? Opinions, thoughts and adventures of a young conservationist. Nature deficit disorder: is it having a detrimental effect on kids today?